Most citizens in Asia fear the mailman, someone who brings the dreaded monthly bills to the front door on a daily basis. 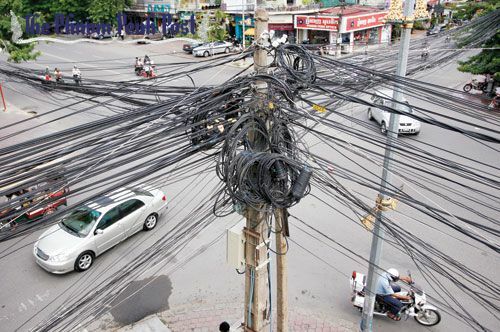 In Cambodia that same mailman will bring a bill that comes with a stern warning this month – the state power company Electricite du Cambodge (EdC) will include in their monthly bills a warning that could have you in court if you decide to break ranks. The warning from EdC says that customer are not to use their Facebook and social media accounts to make “irresponsible” complaints that affect the company’s “honour”. The stern warning comes amid the government’s growing sensitivity to online criticism. That sensitivity has landed several students and lawmakers in prison for their online bashing. EdC also noted they will begin to feature a one-year history of electricity use for each and every customer. The new feature is intended to assist those who misunderstand their charges over an extended period of time, not just the month in which many attempt to dispute or complain about. Sources say that the company will expand the defamatory warnings at a later date. EdC did not return calls for an explanation of the recent warning. The company mentioned however that a wave of customer complaints over unacceptable billings last year caused a ‘movement’ to destroy the country’s Energy Minister, Suy Sem and his agency. EdC did not post what laws customers would be prosecuted under if they should decide to post defamatory comments about the company. Legal experts say that defamation within the country is only prosecutable if the complainant posts something that is demonstrably untrue. Those same experts say the country’s power grid system can at times be unstable and subject to down times, creating unsatisfied customers throughout the country. Human rights groups in Cambodia have accused the government and the court systems of applying an overly broad definition of defamation in cases against criticism.